Photo: Jennifer in front of the University’s Mascot “The Nittany Lion.” Courtesy of Jennifer Tinneny. 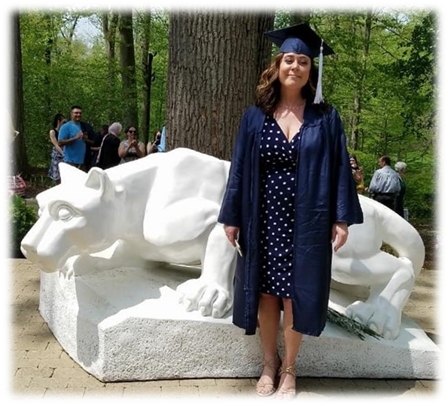 Jennifer Tinneny, daughter of Robert Tinneny Sr. and Shirley Willis graduated from Pennsylvania State University - Abington on May 4, 2018. She earned her Bachelor of Science degree with a major in Rehabilitation and Human Services. She will continue to use skills learned in her studies at BARC Developmental Services where she works with people with disabilities. She plans on earning a Master’s degree in Family and Youth Counseling. In the photo she is standing in front the university’s mascot statue. The Nittany Lion. Jennifer is the great-great granddaughter of Patrick “Yankee Pat” Tinneny of Goladuff, Newtownbutler, County Fermanagh, Northern Ireland; Greenock, Scotland and Philadelphia, Pennsylvania.